I am trying to blog everyday in August. Not sure why, but we've all gotta have goals right? I was just about to make a list of what my goals should be, but why put that out there? Then my husband and my mom might want to help me achieve those goals. And I don't really want to go there. So, I will blog! Since I am choosing to blog everyday. It will be about random things. I guess that is what my blog is anyway. It's a scrapbook of my random life. Today Katie and I stopped by Golightly's to take pics for their blog. This is Melissa's cute space. Hey, Melissa! Katie climbed up the stairs...twice. I am always in favor of stair climbing, because it will insure good sleep later on! The real reason for my post today is to make you the boss of me! I have started a project in my dining room and I need to finish. So I figure if I put the unfinished ugly pics out into the world, it will motivate me to finish them! This corner cabinet was black and it's on it's way to being white with a brown background. Have I mentioned I hate painting? I am painting my table and chairs white too. The walls are staying pink, because there is no better color than pink! 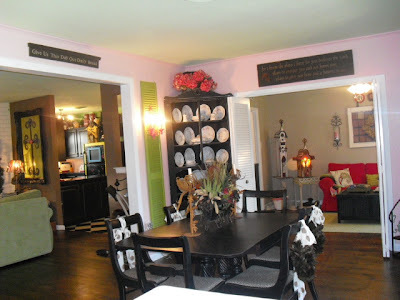 I wanted to paint it brown, so my pink mantel can go on that wall. I am going to paint that black mirror on the left, white. And this little table will be white too. I wish I loved painting. I really wish I had a painter on my payroll. One that I could call on a whim and he would just be ready to paint whenever I got that redecorating itch. He would be busy! I think the better idea is to teach Katie to paint! That's how she can earn her keep around here! What's with the itch to paint everything white? Just wonderin'. That's hilarious! With all the painting you do, I thought you loved it! Good luck with blogging everyday. That would be really hard for me because I'm not that creative when it comes to writing. Also, have you ever turned your blog posts into a book? I use blog2print. I usually print 6 months of entries at a time. It really helped me remember the stories for my scrapbooking. I can't wait to see your finished dining room!! !